SANTA CLAUS, Ind. (CNS) — Belief in that iconic Christmas figure, the rotund merry man with a bag full of presents, inspires thousands of children to write letters addressed to “Santa Claus” each year. Surprisingly, many of these wish lists actually do get delivered to Santa Claus. But rather than landing in a magical workshop at the North Pole, the notes wind up in a little Indiana town that bears the same name as the jolly old elf. Koch and a dozen other volunteers work long hours to “help” Santa answer the letters that find their way to the Santa Claus post office. Koch calls this letter-writing a ministry and is dedicated to keeping the spirit of Santa Claus, the person, alive. The town itself, with a population just over 2,400, seems to embody the persona of Santa Claus. Streets are named “Sleigh Bell Drive” and “Candy Cane Lane,” or even “Melchior,” “Balthazar” and “Kaspar” after the traditional names of the three wise men. Unsurprisingly, the Catholics of the town named their church after the man who inspired the myth: St. Nicholas. “Just looking at his acts, we just see this kindness and seeing those who were less fortunate,” said Father John Brosmer, pastor of St. Francis of Assisi Parish in Dale, which encompasses St. Nicholas Church and two other nearby worship sites. St. Nicholas, also known as Nicholas of Myra, was a bishop in present-day Turkey who lived from about A.D. 280 to 343. He was the orphaned son of wealthy parents, and one ancient story claims that he threw bags of gold through the window of an impoverished family in the dead of night. “What’s really memorable about it is that it’s an absolutely ordinary act of charity, of goodwill. This is the kind of thing that anybody can do,” English said. That simple act of generosity inspired generations of anonymous gift-giving. Givers attributed mysterious presents to St. Nicholas and passed his story from culture to culture. In the Netherlands, his nickname was “Sinter Klaas,” which evolved to “Santa Claus” when Dutch immigrants arrived in New York. St. Nicholas’ identity was forever established as a “jolly old elf” by the famous poem “A Visit from St. Nicholas,” penned by Clement Clarke Moore in 1822. “[The poem] starts to change him from being a Christian bishop, stern and austere and presiding over the Eucharist, to being more of a gift-giver who’s maybe more a magical creature,” said English. Today, the familiar images of this magical man are recreated throughout the town of Santa Claus. Huge statues that adorn the main highway and the town hall depict a smiling, rosy-cheeked figure with a large bag of toys, his red coat and hat looking nothing like clerical garb. Still, for Santa enthusiasts, even this depiction echoes Christian beginnings that were simply transformed by American culture. “I use the expression ‘extreme makeover,'” explained Father Joseph Marquis, a Byzantine Catholic priest who runs the St. Nicholas Institute. His program, based in Detroit, teaches the saint’s history to professional portrayers of Santa. “They took away his miter and gave him a triangular cap and his bishop’s coat was shortened and lined with fur. The candy cane is an evolution from the crosier,” Father Marquis said. Nicholas of Myra likely lacked the rounded figure characteristic of a diet of milk and cookies. His place in history would paint a stature hardened by persecution, perhaps even bearing the scars of torture. A contemporary of the emperor Diocletian, Nicholas lived through the most terrible persecution of the early church and was himself imprisoned. “We know for sure his nose was broken,” said Father Marquis, referencing historical research done on the bones of the saint. “They tortured his priests who were members of his flock to make him recant and he wouldn’t do it,” Father Marquis said. Nicholas of Myra also was hailed as a defender of justice, which might have led to Santa’s common question to young children, “Have you been good?” and the naughty-nice list that he must “check twice.” According to one legend, the bishop found out that a local judge had accepted a bribe and falsely condemned three men to death. “Nicholas ran to the spot and literally grabbed the sword out of the executioner’s hand,” related Father Marquis. “He pointed right at the guy for condemning them to death and the man actually confessed that he took money to condemn them,” he said. St. Nicholas Church hosted a visit from its namesake to anticipate his Dec. 6 feast day. A white-bearded man wearing a miter and long red robes made a surprise appearance at the Sunday Vigil Mass Dec. 2 and handed out ornaments to all the parishioners. 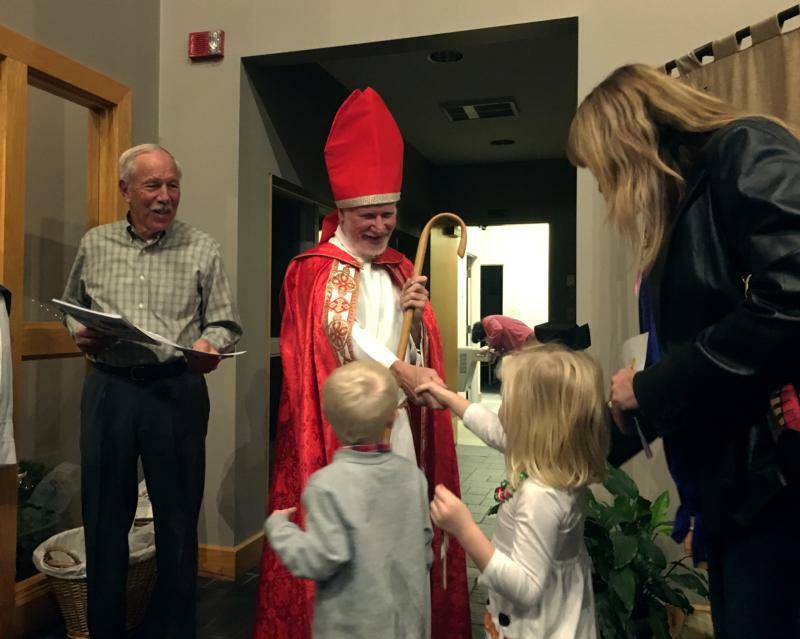 “You can’t get away from Santa Claus here,” laughed parishioner Deacon Jim Woebkenberg. The voice of St. Nicholas likely pursues Catholics during every Sunday liturgy. Historical documents confirm that Nicholas attended the Council of Nicaea in 325. While his direct contributions, if any, are unknown, it was during this council that the Nicene Creed was written. “You have echoes of the voice of St. Nicholas every Sunday when we recite the creed, which for me as a big St. Nicholas fan, indebted to him for so many things in my life, that’s important to me,” said Father Marquis. Similarly, every bright-eyed child who rushes to the Christmas tree Dec. 25 is indebted to this saint for the legacy of giving. But just as the town of Santa Claus stays on the map even after the holiday season, the local pastor said that the true spirit of St. Nick leads Catholics to generosity all year long.